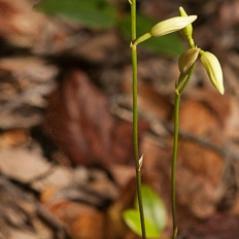 This genus contains terrestrial orchids that are fairly uncommon, and often inconspicuous. The distribution of this genus is centered in the Bahamas, Cuba, Hispaniola and Puerto Rico and a single species is found in Florida. The plants are often overlooked or hard to identify because, the plants are very slender, dormant for long periods of time, may not flower annually, and the flowers do not open widely. 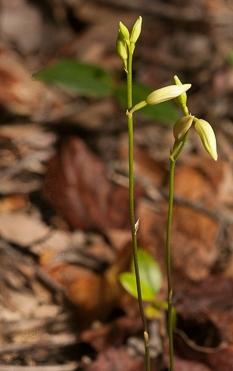 The plant consists of a tuberous root from which a slender scape arises. They have erect, smooth, sometimes branched stems with one or two, deciduous dark-green leaves. When in bloom, the inflorescence is a spicate raceme with a few, distantly spaced flowers. The flowers are dull in color, primarily yellows and greens with narrow sepals and petals. The white tri-lobed lip has broad, roundish side lobes and the small mid-lobe has a notched tip.